Habit: Subshrub 5--25 cm, +- prostrate or long-trailing to decumbent; not glandular. Leaf: +- 2-ternately dissected, +- sessile, stipules 0; leaf 5--15 mm; segments linear, generally acute, ribbed abaxially, grooved adaxially. Inflorescence: raceme, terminal, 1--10 cm, narrow; bracts ternately dissected; pedicel bractlets 0. Flower: hypanthium hemispheric, bractlets 0; sepals +- 2 mm, ovate; petals +- 3 mm, +- obovate, white; stamens +- 20; ovaries 4--6, free, superior. Fruit: follicles 4--6, +- 4 mm, leathery, sparsely hairy, dehiscent along both sutures. Seed: > 1, +- fusiform, flat, smooth. 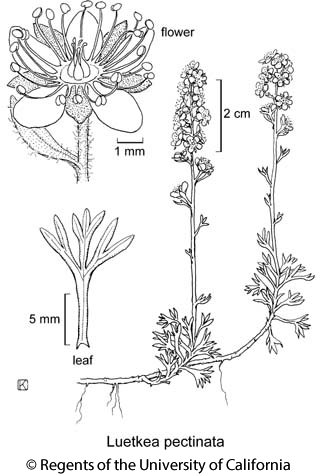 Citation for this treatment: Daniel Potter & Thomas J. Rosatti 2012, Luetkea pectinata, in Jepson Flora Project (eds.) Jepson eFlora, http://ucjeps.berkeley.edu/eflora/eflora_display.php?tid=31669, accessed on April 20, 2019.